Rio Tubarao y alrededores (cultura guaraní, arqueología, bosque: Mata Atlántica, geología y diversidad biológica). The Ambient Protection Area (APA) for the southern right whale is an area that encloses 156,100 hectares in the center-south coast of the State of Santa Catarina – Brazil, created for the federal executive government order dated on September of 2000. The decree object was to protect and harmonize human activities beings with the presence of the whales, to promote the sustainable development and to control the tourism activities linked to whales’ observation. The protection area includes the coves of bigger concentration of southern right whales with younglings, and important terrestrial areas, dunes, bathed, lagoons and many archeological sites (Guaranies). The area is under the control of the Brazilian Institute for Environment Protection (IBAMA) that it defines the rules for the tourism, by the n°7,643/87 federal law and by the IBAMA 117/96 and IBAMA 102/06 normative instructions that are applied to the all Environment Protection Areas (APA) like this, and these legislations guarantee the protection of the whales against improper disturbances. The APA understands 9 municipalities located in the south coast of the State of Santa Catarina, where almost 1.000.000 of inhabitants lives. 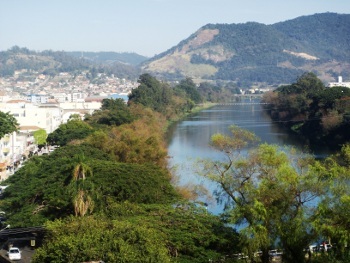 Economy in these cities is linked to the tourism and agriculture activities, except for the cities that located in the Florianópolis (Capital of the State) area, whose activities are tied to the industrial production and services (mainly in the area of the TIC ́s). Meanwhile an activity that occupies great part of the local labour is artisan fishes that together with the tourism are the main activities regulated by the Public Decree of creation of the Environment Protection area. The main objective in this work-area will be to analyze the effects that the legislation had caused to the most productivity economic activities like tourism, culture and fishing, and its social impacts.